You are heading Agricultural Robotics research at Washington State University. Please tell us briefly about your current research. As the world population is hitting 9 to 10 billions over the next 30 to 50 years, and as the current population from underdeveloped and developing countries start to be more affluent and consume similarly to what we do currently in developed countries, demand for food will increase rapidly and substantially. The world, therefore, is faced with this critical challenge to substantially and sustainably increase the production of these essentials with limited or even decreasing farming resources. In addition, availability and cost of farming labor have been and will continue to be one of the most critical challenges in continuing agricultural production around the world, whether that be USA, Europe, China, Brazil or Nepal. Recognizing this challenge, I have devoted my career into developing mechanization and automation solutions for farming that would reduce the use of labor, water, fertilizer and other inputs while increasing the yield and quality of agricultural products. Currently, I have been focusing on developing robotic technology for fruit crop harvesting, fruit tree pruning, and crop thinning. In addition, I have worked on developing and optimizing mechanized harvesting of sugarcane and other cane and grass crops grown for biofuel production. Recently, I have been focusing also on automating various farming operations for vegetable crops (e.g. robotic weeding), grapes (e.g. SMART Irrigation using Internet of Agricultural Things, Big Data and Artificial Intelligence), blueberries (e.g. using drones to deter birds), strawberries (e.g. harvesting), and raspberries (e.g. cane bundling and tying). I also focus heavily on collaborating with professors, scientists, and entrepreneurs from developing countries to transfer the knowledge and technologies for addressing specific challenges of agricultural industries in those countries. Some of the countries where I have been focusing on to promote such activities include China, Malaysia, India, Thailand, Peru, Brazil and of course Nepal. You grew up and studied in Bhojpur until high school. Did you work on farms? When you share your early experience in agriculture to your colleagues and students, how do they respond? I appreciate your research to refer to my roots. It makes me nostalgic every moment I think of Bhojpur. There is no better place than your motherland, specifically where you grew up. Growing up as one of the many children of a lower middle class family in this remote district, I have experienced the ins-and-outs of subsistence farming, which must be all the same as most have experienced in this mid-hill region of Nepal. I wrote a small article several years ago for publication in my high school’s journal, where I have briefly talked about a typical day of my school-age. I was a farm kid doing all I could to produce everything we needed for our family, paddy rice, corn, soybean, sugarcane, oranges, lemons, peaches, bananas, beans, chicken, goats, buffaloes, bulls; you name it. And I have experience working on pretty much all the operations for all of these crop and animal farming the way it happens in our mid-hills. People are generally surprised when I share my experience in farming so many different types of crops and animals, more generally my experience as a child. However, people are more surprised to hear that I used to walk two days straight crossing the same river from one bank to the other 22 times, along the way, and sleeping on a bamboo hut on riversides in between, to go back and forth my home and college. What was your aspiration when you were in high school? What was your aspiration while you were an engineering student at Pulchowk Campus? As I talked about in an incomplete blog I wrote several years ago, to me, aspirations come in the form of a ladder. Your dreams are somewhat bounded by your horizon of exposure and experiences. Growing up, the best thing I saw around was a junior officer of a government office at my district headquarter and that is what I wanted to be. Never to disregard the value of the services these individuals provide to the everyday lives of everyday people in those remote places of the country; but being a researcher or a professor was not something my head could wrap around back when I was in high school, let alone traveling overseas to be trained for that. As I got unexpectedly good grades (from a public school) during my School Leaving Certificate (SLC) exam, my elder brothers thought I should do a technical degree. Again, being a lower middle class kid, what could be a better option than becoming an overseer so that you could almost be guaranteed a job and would start earning a reasonable salary right after three years of the vocational training. Once I moved to Kathmandu for my overseer degree, the horizon widened, and so did the dreams. I aspired to be an Engineer, and then that led to another aspiration and thus a new step would be added to the ladder of dreams. A lot of talented students from Pulchowk Campus back then went to Asian Institute of Technology (Thailand) for MS degrees funded by foreign governments. I aspired for the same during my later years as an Engineering student. You are a professor at one of the most prestigious universities in the United States, which is a big achievement for even the top students there. At what point in your academic journey did you realize that you could actually become one? What professional and personal aspects made you competitive? As I discussed earlier, my aspirations were formed as a ladder or a ripple formed on a lake, one step and one circle at a time. I did not think about being a professor until I was in the second year of my PhD at Iowa State when I started to find out that I could conduct publishable research (certainly with a lot of coaching and language edits from my supervisor) and that my English would be OK to share research findings to the world. PhD programs in USA are designed such that it is not enough just to conduct some specific research leading to a dissertation. PhD is a process, that makes you matured, gives you opportunities to learn interpersonal skills, building trans-disciplinary and diverse teams and managing them to achieve specific goals, understanding research enterprise including funding mechanisms, proposal development, project implementation and student supervision, and be involved in university teaching. All these tools helped me become productive in research and publications as well as to build professional networks. More specifically, a good list of peer-reviewed publications during a PhD program, long and wide teaching experience both in Nepal and in USA, and experience with a wide range of research projects must have helped me be more competitive. Other factors giving me some competitive edge could be my multi-disciplinary educational background from Civil Engineering to Computer Engineering, and then to Remote Sensing, GIS, and Agricultural Engineering to Human Computer Interactions, and my involvement in leadership activities in student organizations and sports teams. Lastly, during my PhD, I participated in a program on preparing future faculty, that provided a lot of tools and ideas to be successful both as a candidate and as a faculty member in a university focusing on cutting-edge research, effective education and impactful outreach activities. I would also like to add that, to be a successful researcher or a professor, one of the most important traits one needs to have is the enthusiasm and dedication to research and education, and resilience to failures. Besides teaching and doing research, you need to raise funding for your lab. It requires active networking, negotiation and promotional skills. As someone coming from Nepali culture, what was your strategy to learn those skills or do you think that if you do exceptional research, it speaks for itself? Thank you very much for asking this question. I need to emphasize that how successful we are in research and scholarship in the United States (and for that matter everywhere) relies heavily on how successful we are in acquiring research funding. There are local, state and federal funding agencies in the USA targeting different types of research projects. Agricultural research could be funded by local commodity groups and state agricultural departments, but these funds are generally small and allow only preliminary studies. More important and larger funding could come from private industries and federal funding agencies such as United States Department of Agriculture (USDA) and National Science Foundation (NSF). These agencies provide research funds through highly competitive proposal review process with a success rate in federal programs ranging from 5 to 10%. As you mentioned, developing successful proposals require long and sustained efforts in networking with researchers, scientists, engineers from private companies, and program managers from funding agencies, among others. As someone who grew up in Nepali culture, it is sometimes challenging to highlight your work and expertise; we are generally hesitant to talk highly about our work and new ideas. However, through rigorous training we get during PhD programs, we learn (to some extent) how to be effective in presentations, and formal and informal conversations. 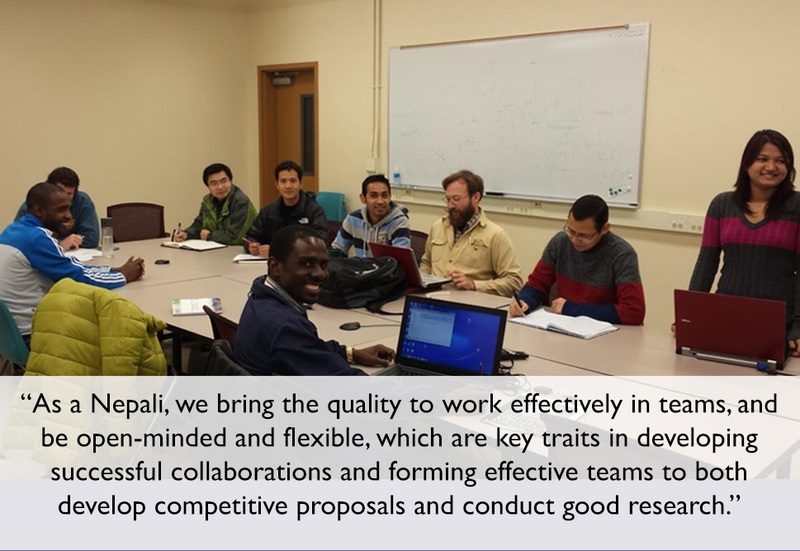 On the other hand, as a Nepali, we bring the quality of being able to work effectively in teams, and being open-minded and flexible, which are key traits in developing successful collaborations and forming effective teams to both develop competitive proposals and conduct good research. Over time, records will start to advocate for yourself; what kind of funds you have acquired in the past, how frequently and where you have published and who you have collaborated with will start to make a difference. Also, the students, post-doctoral researchers and other scholars you have supervised from around the world would help build goodwill (assuming we have done a good job) and create a support network. Your research seems to be very relevant and important for Nepal. How can we transfer such knowledge and technology in Nepal? This is a great question. Ever since I started working on Agricultural Automation and Robotics, I have always thought about how I could potentially bring the knowledge and technology I and other researchers around the world have generated to improve the productivity and produce quality while minimizing labor and other inputs in Nepali agriculture. There is not an easy, straightforward answer to this crucial question. There are two particular challenges: farm size and cost of technology. We need to be innovative in learning from the knowledge and technologies generated in developed countries targeting larger farms and adopt them to Nepali context where we are dealing with fragmented land (or small fields), fields with higher slopes, and/or terraced plots, operated mostly by stakeholder farmers with low to non-existent capital investment. In addition, I would like to emphasize that no technology or knowledge could be directly utilized in farming in Nepal as we are dealing with a system (farming) that varies widely over space and time and requires a unique solution that could be developed/optimized only through local or regional research and field evaluation. But I believe recent advancement on sensing and computational capabilities with ever decreasing cost makes it possible now to dream about using mechanization, automation and robotic technologies for farming in Nepal. For example, larger farming industries around the world have adopted automatic guidance and steering system that can drive a tractor precisely (within a few centimeter) over predefined paths allowing tilling machines, planters, or harvesters to go over the same path over and over again avoiding the need of a driver to attentively perform such jobs. Such a technology can minimize the labor use while also avoiding both the overlapped and missed areas in the field by any implements (e.g. chemical applicator). However, we are talking about a tractor costing $750,000 (~NRS 8 Crore) with guidance technology costing $30,000 (~30 lakhs). I envision that we could develop a similar technology for autonomous operation of small and “Haate” tractors used in Nepal farms using low-cost sensing technologies and artificial intelligence techniques such as deep learning. Such a technology can release operators to work on something else when the tractor is plowing the field on its own. Another example that could be viable (as the cost of the technology has gone down rapidly) is the use of drones for crop monitoring, targeted chemical application, bird deterrence and may be monkey deterrence (which is a big issue in hilly areas). Robotic weeding and crop harvesting (fruit and vegetable) are also becoming viable as we are moving towards smaller, modular robots operating collaboratively in farms, which allow each farmer to have one, a few or hundreds of those robots depending on the farm size. Another area that I believe we can make a quick impact is to develop and use smartphone-based techniques for crop monitoring and management. As smartphones are so widely used, it makes a lot of sense to utilize the capability of this tool. For example, we are developing projects to use smartphone cameras to take images of crops with various issues (could be disease, insect or other issues) that farmers do not know what exactly is going on. The smartphone app could process the images to identify what could be the issue and recommend some management or treatment schemes based on automated image analysis and experts knowledge gathered and stored in the database. This way, remote farming communities without any access to technical and scientific expertise would be able to harness the expertise from all around the world using a ubiquitous tool. There are various ways I think we could perform applied research in Nepal to adopt such technologies. For example, I have collaborated with Dr. Arun Timilsina and other professors from IOE to organize a summer school related to agricultural robotics and are exploring opportunities to fund undergraduate project teams to work on adoption of technologies being developed at my lab to solve challenges in Nepali farms. I am also involved with Phutung Research Institute as an Expert Advisor and exploring ways we could transfer knowledge and technologies in agricultural automation and robotics. Similar collaborations could be established with NARC (National Agricultural Research Council), National Innovation Center (led by Dr. Mahabir Pun), Center for Applied Research and Development (IOE) and other research centers and institutes to innovate ways knowledge and technologies could be adopted in Nepal. Close collaboration with farmers in various parts of Nepal would also be essential to understanding the unique challenges they are facing and to evaluate solutions in their farming operations. It is also important to emphasize that promotion of commercial farming supported by land consolidation and/or cooperatives could speed up adoption of mechanization and automation technologies in farming, which has been a priority of Nepali government in recent years, but results are yet to be seen. As someone who had studied in Pulchowk Campus, what do you say about the research scenario in Nepal? How can we bring more research culture in Nepal? Research and development is the only way to develop knowledge and technologies suitable for Nepali context (whether that be in agriculture, tourism, medicine, or infrastructure), which is a key for the rapid and sustainable development of the country. Therefore, an increased emphasis on research and research-based higher education is essential. When I was finishing up my undergraduate degree at Tribhuvan University (TU), Pulchowk Campus in the early 2000s, I did not get any exposure to research and development space. In recent years, the situation might have improved slightly. Various PhD programs have been started under TU’s Institute of Engineering (IOE), and there has been generally increased interest in graduate education and research in other disciplines in different Nepali universities. As I mentioned earlier, there also are some organizations established to conduct fundamental and applied research including the IOE’s Center for Applied Research and Development , and National Innovation Center long advocated and established by Dr. Mahabir Pun. There also exist various government agencies tasked for supporting and/or carrying out research and development activities including University Grant Commission, NAST (Nepal Academy of Science and Technology) and NARC (National Agricultural Research Council). There was a small increase (about 10%) in the budget provided to University Grant Commission in the new budget proposed by Nepali government recently, which might translate into slightly increased research funding. Though there have been these subtle improvements in research culture and scenario in Nepal over the last decade, I have not seen any tangible results yet indicating that more could and should be done. To give you an example, I have hired a number of students from Tribhuvan University (Pulchowk Campus as well as other branch and affiliated campuses) to my research program over the last 7 years. These students, in general, did not seem to have experienced a culture and environment much different than what it was like 20 years ago when it comes to students’ exposure to research and development. One way to improve research culture would be to attract researchers trained in well-known foreign universities and with substantial experience in research and development to lead research labs under national/state universities and government research agencies. I would also envision that various research centers could be established under TU and other universities to conduct specialized research, development and graduate education in areas of key national interests. What qualities would you look into a prospective graduate candidate in your field? First of all, academic performance is a simple, and straightforward but important key for me; to be specific, what kind of grades a student has over different educational levels would make a huge difference. It tells me one important quality of the student; that she/he is not only intellectually qualified and interested in the discipline, but also dedicated and serious about what he/she does. I understand, there might be situations causing transcripts not to reflect the true qualities of students. In those cases, personal statements and recommendation/reference letters will speak and advocate for the gap. Besides, how matured, independent, innovative and self-starter a student is would set her/him apart from the rest. As a graduate student, she/he is expected to contribute new knowledge or innovative technology to the world. 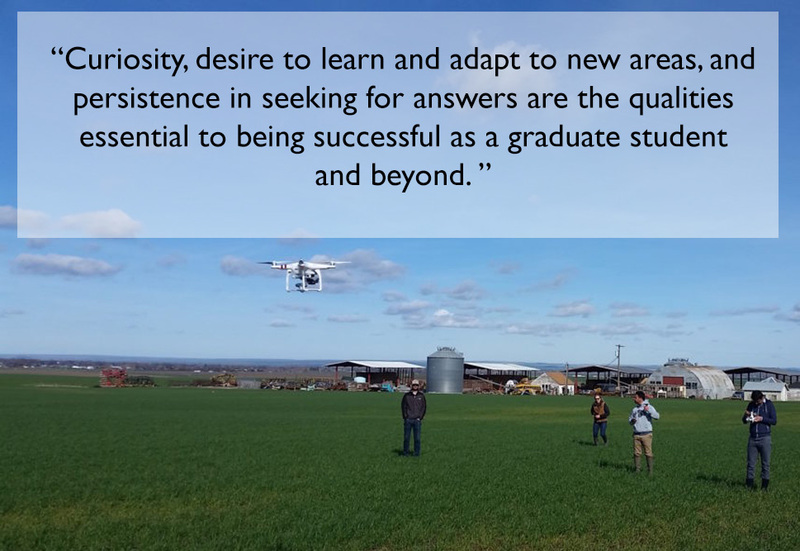 Curiosity, desire to learn and adapt to new areas, and persistence in seeking for answers are the qualities essential to being successful as a graduate student and beyond. As we go specifically into my research field, an engineering degree with some understanding of sensing and measurement systems, data/image processing techniques, dynamic systems, machine design and mechatronics would be helpful, but when a student has the qualities and traits I discussed before, other skills can be developed easily. How can prospective graduate students prepare themselves for being a part of cutting-edge research labs in your field? As I discussed earlier, the best advice I can give a student is to focus and work hard on what they are doing. Life is too short to spare on something you do not like. I know in Nepali context, we all want to have only certain career choices. But I think the opportunities are much wider now in Nepal and endless across the globe. If a given discipline/area is not something you like, move onto something you enjoy doing. If engineering is not something you enjoy, maybe psychology is. But then whatever it is that you find interesting, give 100%. If you are working on an engineering degree, I assume you enjoy it. Now is the time to go deeper and wider to understand the fundamental concepts such as calculus, statics and dynamics, design and control, and data/signal/image processing and acquire tools such as various programming languages (including mobile platform) and 3D designs and animation. Specifically for field and agricultural robotics, background in agricultural, mechanical, or computer/electrical/electronics engineering would suit the best, but any engineering degree would be good as long as the student is willing to work outside in the field environment under rain or sun at 10 °F or 110 °F (Can’t convert over the top of my head how many °C that would be anymore). It is also important to be familiar with what agriculture is, in general, what are the challenges there and how could an engineer help solve those challenges. About standardized tests, GRE is not that important indicator to me, but language skill is. Experience with paper and report writing is valuable. Also, important would be to have good skills in preparing and presenting posters and oral talks supported by appealing graphics. 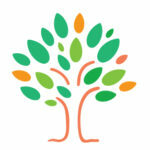 Tell us about the role of mentorship in your professional life. I discussed earlier what role a PhD supervisor has played in my life and career. Without taking a lot of time now, I would like to simply say that our life follows a complex trajectory and the steering forces provided by mentors at various stages of life are truly essential to maneuver well and succeed. My parents being the first and continuous mentors, provided the basics: how to be a good human being. At each educational level, there were one or more teachers or professors who provided a role model for me to strive for the best while discarding or minimizing the effects of distractions that existed at respective stages of life. On the last meeting before I left Iowa State University, my PhD advisor, Dr. Brian Steward said “Do not say yes to everything”. I always struggle to say no to any requests come to my way, even now, but I have long realized how important it is to prioritize focus to be successful professionally while supporting and giving enough time to your family. The career advice you wished you received in your twenties. I do not really know what would that be! Perhaps something like, ‘Do not wait to enjoy life!’ . Please share your experiences on opportunities and responsibilities of being at the forefront of state of the art research as a Nepali person. First of all, I am fortunate to have been through the training and experiences that allowed me to be successful in joining a great university to perform impactful research and educate the next generation of engineers and scientists to solve the challenges in a sector closest to our existence, agriculture. This position allows me to work on what I find are the most important challenges we are facing now and also what could be the challenges in medium and to long term. As a professor, I get to work with young, energetic and talented individuals from all around the world, which keeps me always young (at least that is what I think), energetic, and most importantly happy. 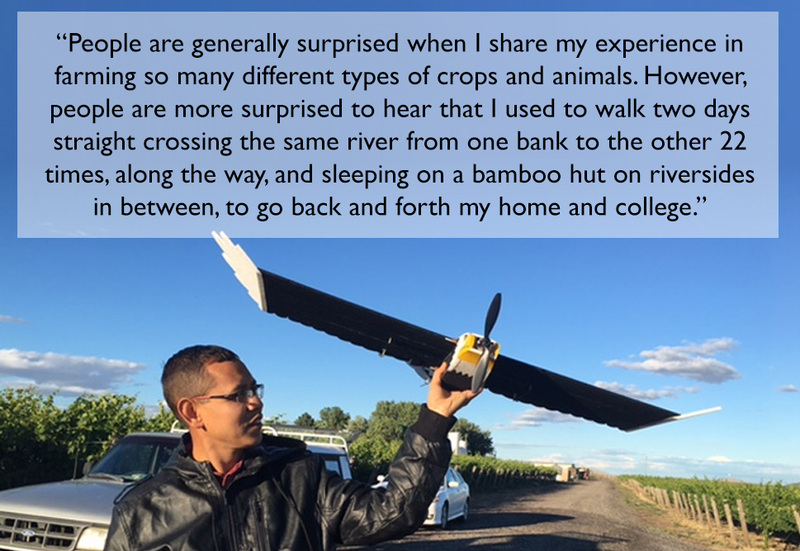 I get to travel around the world sharing what we have learned and developed and then learning from leading researchers in agricultural automation and robotics so that my next steps in research and development could be more efficient and effective. I understand that this opportunity comes with an obligation to strive for even more innovative and transformative solutions that can make wider, positive impact to farming communities around the world including those in Nepal; I am trying hard to live up to that. But please understand that I am doing only a very small part of what has been accomplished in research, scholarship and education by hundreds of fellow Nepali professors and scientists contributing immensely to the advancement of humanity around the world. One of the exceptional examples is Dr. Parag Pathak, professor at MIT, who was recently awarded with the John Bates Clark Medal, considered second only to Nobel Prize in economics. Your final words of advice for the youths in rural Nepal who want to excel in the international platform. Again, I talked a lot and talked a whole lot earlier about where I come from and how could one opportunity would lead to another if we work hard and focus. I just want to briefly repeat myself in other words; geographic location, language, and availability of resources (or their lack of) or for that matter whatever else that seems to be hindering your aspirations at a given moment, do not have the power to do so if you are determined to excel in anything and anywhere you chose. 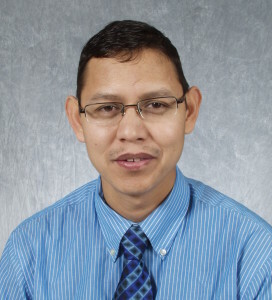 Manoj Karkee is Associate Professor at Biological Systems Engineering Department, Center for Precision & Automated Agricultural Systems, Washington State University. He leads a highly prolific research program in agricultural automation and mechanization with a particular emphasis on machine vision and sensing technologies for agricultural automation and robotics. His work has been covered widely as potential game changer in agriculture. He has a PhD in Agricultural Engineering and Human Computer Interaction from Iowa State University, M.E. in Remote Sensing and GIS from AIT, Thailand, and B.E. in Computer Engineering and an Associate Degree in Civil Engineering from T.U., Nepal. He is originally from Bhojpur where he studied till high school.